O, WOW! Surprise from Oishi! Funny surprise! Tonight, I was in a middle of a phone conversation when somebody rang the doorbell. 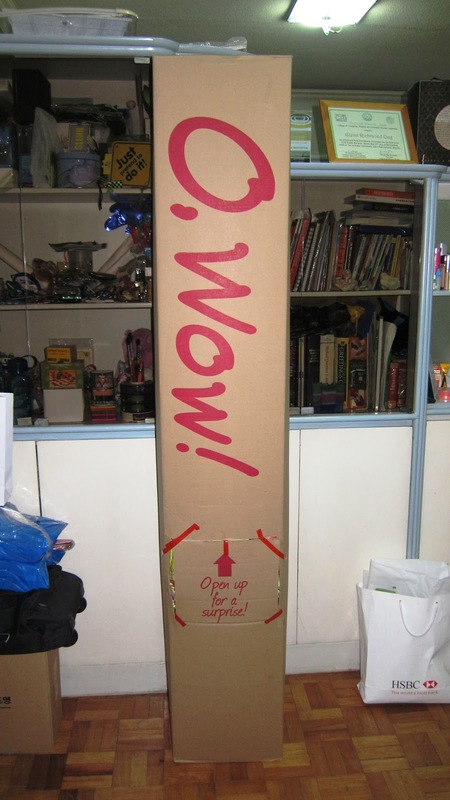 After some time, our helper brought in this HUGE box with "O, Wow!" printed on it. My mom was like, "ano nanaman yang inorder mo?" (what did you order again?). And I said with a clueless face, "what?" Then I saw this in front of me - "Open up for a surprise!" I started wondering what could be inside the box. Is it be a mannequin, a tiny little thing mixed within a bunch of other stuff, a new gadget? Then I opened up the red envelope that came with it. It's from Oishi. Sweet! Oishi just remembered me and sent tons of snacks for me to devour and share. Maybe they knew I wanted to get bigger after losing 8lbs? Haha! When I say HUGE, I mean it! You know, I stand 5'11" and yet this box is taller than me. It's packed, it's sort of heavy. I continue to wonder until I opened up the box and literally screamed "O, Wow! O, Wow! O, Wow!" These are just some of the snacks that came out when I opened the flap. And there's still A LOT of 'em inside! Whew. I'll start distributing them to our house helper and to my officemates, so that they'd also experience the "O, Wow!" moment. Just a little bit of trivia: the Oishi brand is from Liwayway Marketing Corporation, which started manufacturing yummy snack foods in 1974. I'm sure we all remember the Oishi Prawn Crackers and Kirei Shrimp Flakes. Did you know that "Oishi" (or "oishii") means delicious, while "kirei" means beautiful? Over the years, there has been lots of other food and beverages that we learned to love. There's Bread Pan, Pillows, Potato Fries, Smart C+, and more! I'm sure there will be lots more delicious snacks and drinks coming our way in the near future. In the meantime, I'll enjoy a bag of popcorn first. Bye! Indeed! I was shocked at the amount of snacks it has inside! Haha! Wow! Noche Buena in summer! Noche buena of chips, popcorn, and mooooore! O, wow! Short time sari sari store. Haha! We're so stuffed at home finishing these snacks. Shared it to officemates and friends too. O, wow talaga! Hahaa.